CLUVER -Pannoniae, et Illyrici Veteris Tabula. CLUVER,P. - Pannoniae, et Illyrici Veteris Tabula. 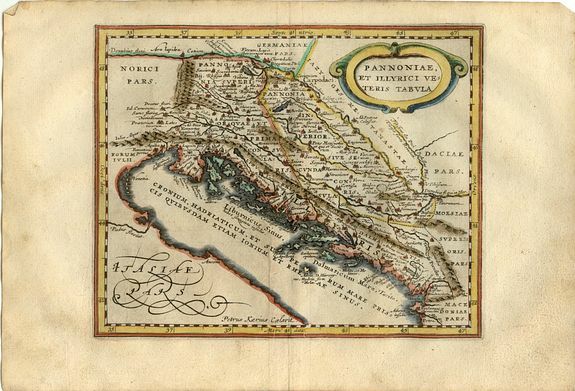 Pannoniae, et Illyrici Veteris Tabula. - CLUVER,P. Title : Pannoniae, et Illyrici Veteris Tabula.. Size : 6.1 x 7.7 inches. / 15.5 x 19.5 cm. Description :Attractive historical map of the Dalmatian coast from Italy to Greece. The map is based on Ortelius' map of the same title, which was based on Gastaldi's map of South East Europe (1560) and other information from ancient sources. Decorated with a strapwork title cartouche. Engraved by Petrus Kaerius. Condition : Good, but the map has a few wormholes in the underborder.